Cogstone conducted archaeological construction monitoring for the extension of the Exposition Transit Corridor Phase II from Culver City west to Santa Monica. Between 2012 and 2014, Cogstone archaeological monitors encountered dozens of historic age railroad features from the Pacific Electric Railway (1911-1953) and from the later Southern Pacific Railroad (1953-1980s) along a 6.6 mile segment of right-of-way in Santa Monica. The features include original railroad crossing signs, train car pulley wheels, original rails and ties, hubstands, and other equipment. 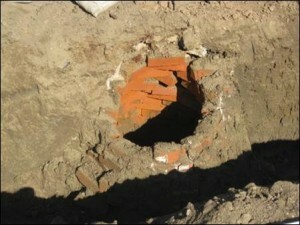 In addition, a number of non-railroad related sites and features were identified documenting the different communities within Los Angeles’ varied history.Two brick-lined, dry wells were uncovered that relate to early twentieth century agricultural activity in Santa Monica. A cache of glass cosmetic compacts, and nail polish, mascara, and other cosmetic bottles, all unbranded were recoded and were possibly associated with a local cosmetics studio or movie-affiliated firm from the 1940s to 1960s. 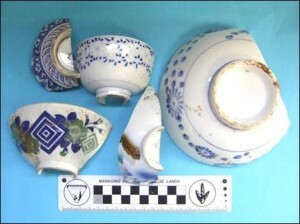 A separate refuse deposit filled with Asian porcelain tablewares of several different decorated patterns, as well as a heavy mortar bowl with incised interior and Asian and American bottles and jars from the 1920s to the 1940s was collected. 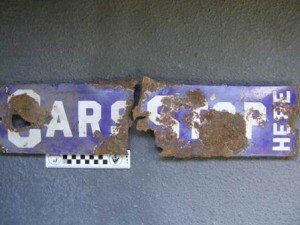 One other refuse deposit from 1929-1935 may represent a hobo camp from the Great Depression. Collected cosmetics containers from the 1940s to 1960s cache. 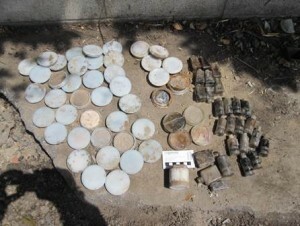 Selection of Asian ceramics from secondary refuse deposit.